In an effort to reduce our environmental impact and support sustainablity, Thuja Wood Art uses all salvaged, reclaimed, or recycled wood. No trees have been cut down to make these items. We use only environmentally safe stains when clients want to clear coat their artifacts to keep the beautiful orange/red tones of the cedar when it is first split and/or sanded. 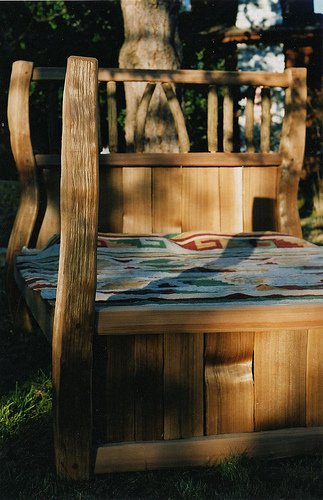 We use both oil finishes and water based stains which penetrate deep into the wood, providing UV protection and helping keep the beautiful colours in the cedar. We can recommend finishes which carry the Canada environmentally safe stamp. For finishing indoor pieces we mainly use Landmark Natural Oil Finish (an all natural/foodsafe blend of Tung oil, Linseed oil, Pine Rosin, citrus, and beeswax). For indoor and outdoor finishing we use the German company OSMO. They are environmentally safe, and have great products and service. No matter what you coat your wood with if it is in full sun, exposed to wind and rain, or near the ocean it will need recoating regularly to keep the colour. Many clients choose to leave the cedar untouched, and it turns a wonderful silver colour in the first few years. 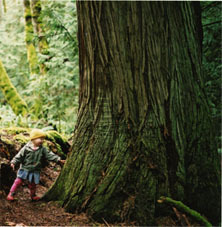 Western Red Cedar, in it’s natural west coast environment of almost continual wetness, contains natural oils to protect it against deteriorating outdoors longer than any other variety of wood. It is the only wood allowed by building codes across north america to be used outside without any coatings. We always make sure to keep posts off the ground with the use of metal saddles, leaving several inches of space for water run off, and providing different options for capping the tops of exposed ends. This ensures a long life with our projects. 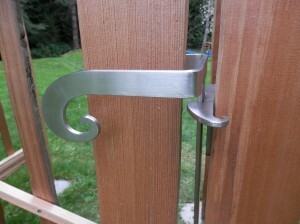 Thuja Wood Art designs custom metalwork for hinges and latches, which are then made by local metalsmith’s, Callum McKay (Stainless By Design) and Jeri Sparshu from Thistle Rock Forge on Salt Spring Island. We craft our hardware from forged steel, and now also stainless steel, which of course, will never rust and has a beautiful lightness with the cedar. Latches are an easy to use sprung design, with a variety of handle shape options. They can also be painted to suit any design. You will not find any better quality latches. (I know because I have tried, and the best solution was to design my own…) Contact us for more information on purchasing custom hinges or latches, pricing, and shipping. 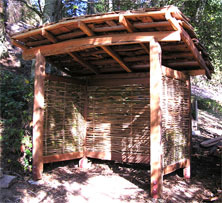 Colin uses bamboo in a variety of projects. Bamboo is a very fast growing and sustainable plant to work with. It is very strong and adds an aesthetic, complimentary quality when used in conjunction with cedar. We hope to grow our own bamboo varieties in the near future. At Thuja Wood Art we are proud to say that we run our vehicles on bio-diesel and straight vegetable oil. 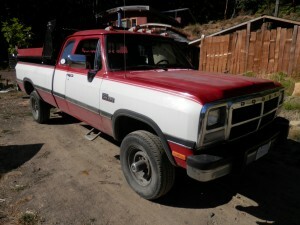 The work truck (1993 Dodge Cummins Turbo Diesel) runs on recycled waste oil from local restaurants.